John awoke on Thursday 10 October to find the weather showery but bright. No doubt he would see action again today. Since the deaths of his grandmother and aunt John had flown almost continuously, claiming four victories, two probables, two damaged and one shared. He had also seen four colleagues killed in action. At 0710 hours, he took off in Spitfire QJ-X with the rest of squadron to patrol Maidstone. After 40 uneventful minutes they were vectored onto a Dornier 17 just east of Brighton. All nine Spitfires descended on the enemy aircraft but experienced real difficulty in firing as their windscreens were iced up meaning the deflector sights could not be used. Two of the Spitfires got in close, fired some bursts and got out. The Dornier flew on. John and Pilot Officer Bill Williams both attempted beam attacks from either side of the Dornier. They missed and continued turning blindly towards each other. Their Spitfires touched, the starboard wing of John’s machine striking the tail of Williams’. John had to bale out but did so too low for his parachute to open. He was still alive after hitting the ground so a priest was able to administer the last rites before John died in his arms. His Spitfire crashed close to him, landing on a flintstone wall that bordered Jubilee Field and St Mary’s Convent in Portslade [Google map]. When his body was examined, John was found to have been wounded in his left arm and leg. Bill Williams, it later transpired, had been shot through the head so was already dead when their machines collided. Censorship meant John’s death was noted in the vaguest of terms in the next days Brighton Evening Argus. It simply said, ‘Our losses yesterday were five aircraft but the pilots of two are safe’. 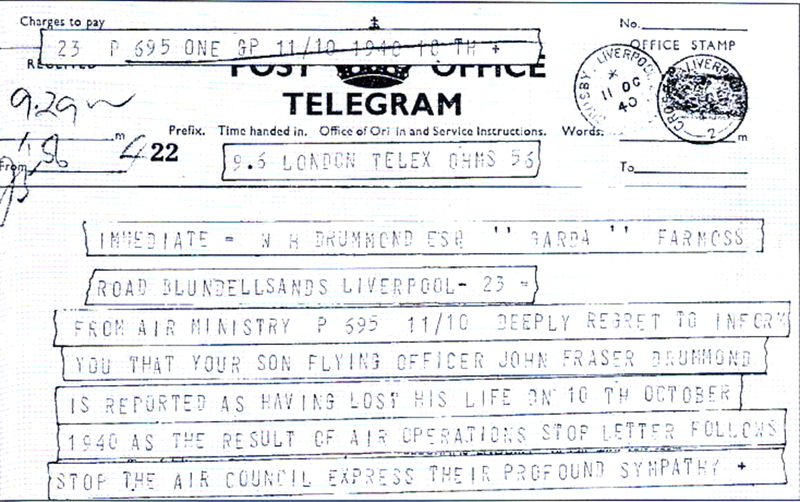 John Fraser Drummond’s funeral took place at St Michael’s church, Blundellsands, on Tuesday 15 October 1940. The service was attended by the Mayor of Crosby among other local dignitaries and the chosen hymn sung was Abide With Me. He was buried in Thornton Garden of Rest just four days before his 22nd birthday. His short life had only known childhood, school, barely a year at the timber merchants and less than three years in the RAF. Today, the first thing that strikes you about the grave is its size and grandeur. It’s a ten foot square kerbed memorial with a stone flower container at its foot and three pointed stones at intervals along each side. The headstone has two grey granite pillars either side of the inscription. The twelve concrete flags which form its base are visible but clearly the passing of time has taken its toll as they are very uneven with grass and weeds growing between the cracks. 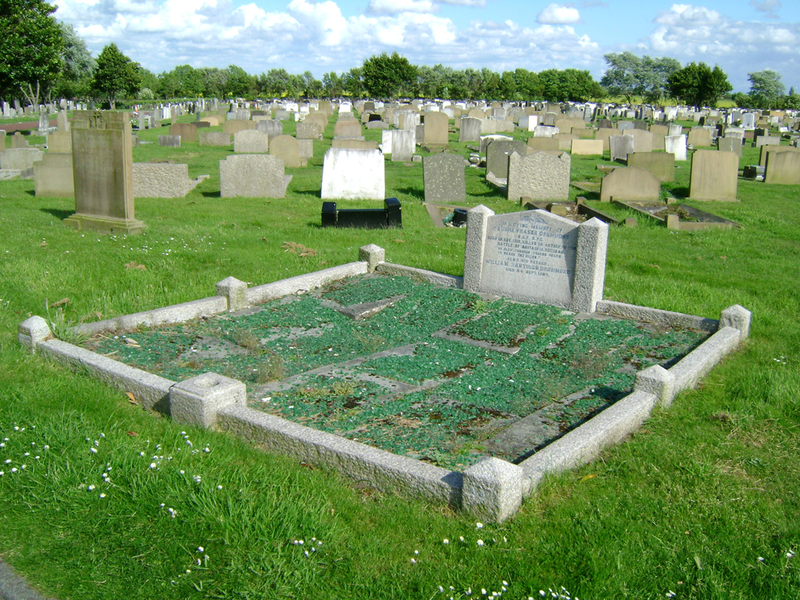 There are some green glass stones scattered across the grave but not nearly enough to cover it. John Drummond was the third person to be interred in Thornton Garden of Rest [Google map]. It stands in Lydiate Lane, built on a site purchased from the Earl of Sefton in 1936, and owned by the Crosby, Litherland and Waterloo Joint Burial Board. It was opened, consecrated and dedicated by Dr AA David, the Lord Bishop of Liverpool, on 23 July 1940. John’s final resting place is Grave 3 in Section A. There are photocopies of the layout of the Garden available on entry. It is in a plot next to the crematorium and on the right as you advance down the driveway. John’s death did not go unnoticed in Germany. During his nightly radio broadcast Lord Haw Haw had this to say about the action that took John’s life: “A single reconnaissance aircraft, returning from photographing the holocaust of London, was attacked today by six Spitfires. Its gallant crew showed great courage in destroying three. The aircraft crashed in France but the photographs have been saved”. John is commemorated in several places. As well as having his name engraved on The Battle of Britain Monument in London and The Battle of Britain Memorial at Capel-le-Ferne, John’s name is engraved on two memorials in Crosby. There is one inside St Michaels Church where his funeral was held, and one in Alexandra Park. He is also recorded in the Book of Remembrance, the casualties list and on the Roll of Honour in St Georges Chapel at Biggin Hill. He is listed in the Book of Remembrance at St Clement Danes, the RAF church in London. There is also a plaque at Wellington School commemorating John Drummond and another old old boy who flew on the Battle of Britain, Edward Graham.